There are many reasons why you might choose Basel as a starting point for a winter sports holiday. If you are living in the city as an expat you are sure to want to try out the world's best ski and snowboard destinations during your assignment. If you are here on business, say for the Baselworld watch and jewellery fair, it seems rude not to take at least a day out to visit the slopes. Also Euroairport, the airport Basel shares with Freiburg in Germany and Mulhouse in France, is a convenient gateway for skiers and snowboarders looking for a weekend or midweek break, or who want to avoid being shepherded around on a packaged holiday. The good news is that it couldn't be easier to use Basel as a base to get to the Alps. And not just the Alps, the nearest resort to Basel is actually in the Black Forest, in Germany, at Feldberg. Basel also lies in the mountain range known as the Jura, after which the Jurassic age is named, and for some of the season there are various winter sports you can indulge in here, with the closest resort to Basel in Switzerland at Langenbruck, in Baselland. The Alpine resorts all lie at least an hour or more from Basel, but getting to the resorts is a doddle. 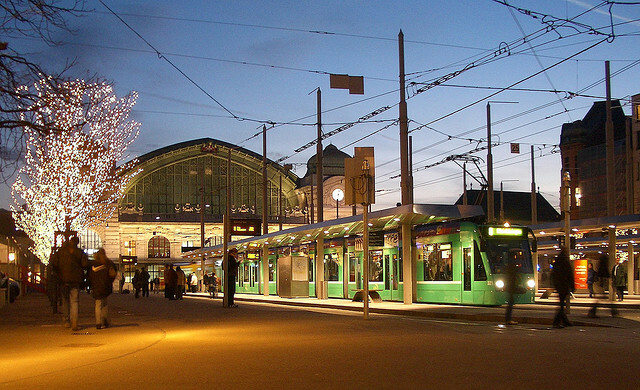 Basel lies at the heart of an efficient road network and the public transport is quite simply the best in the world. I lived in Basel and occasionally used the car, but for most of the 100-plus resorts I have skied in I have relied upon public transport and, despite the sometimes multiple connections, I have only ever missed one connection. Furthermore the getting there, and back, has been for me a large part of the enjoyment of a day out in the mountains using public transport. There is no stress, indeed the trip out there is therapeutic and the journey back is a great opportunity to enjoy some apres ski beers as a most amazing backdrop passes by. For one, two and six day outings, Swiss Rail runs the outstanding Snow'n'Rail scheme with significant discounts on both public transport and lift passes. If you are flying into Basel, the airport is 23 minutes by bus from the Basel SBB railway station (with a tram connection under construction), and there are several timetabled buses an hour. Car hire is available from the airport from all the usual suspects. The motorway network effectively begins with the Basel ring road, 5 minutes drive from the airport. Basel is as well situated as Geneva or Zurich for getting to many Swiss ski resorts. I am not going too much into the ins and outs of travelling within Switzerland - individual resort pages provide more detail for each resort - but below you will find a summary of information on significant resorts, sortable by column. For families who want to make the most of other winter activities closer to Basel than the Alps, please check out the Tips for Families in the Basel Area. As an alternative to public transport or private car, there is the option of using one of the many tour operators who run bus trips to and from selected resorts. Usually these operators advertise in the local papers, and they offer great value - Erich Saner runs day trips at weekends from various stops in the Basel area to places like Sorenberg, Gstaad Mountain Rides and Meiringen-Hasliberg for around SFr 65 inclusive of lift pass. For parties, there are also operators who can provide minbus or coach transport with or without drivers from Basel or the airport, e.g. Busmiete.ch.